7 Tips To Start Reducing Back Pain Today...even if you've been told it's something you'll just have to "live with" for the rest of your life. 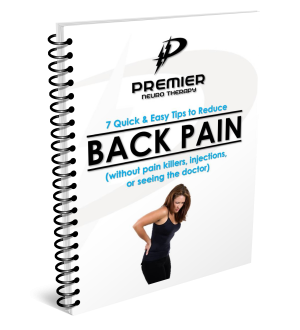 This report is for you if you feel back pain is slowing you down and keeping you from living the active lifestyle you know and love. I'm talking about the type of back pain that causes you to worry whether it's safe to keep working out, safe to play golf, or even safe to bend over to pick up your kids. It's been around for weeks (or even months and years), and you are starting to wonder if it will ever go away. You may have stumbled across other forms of advice - "take some Advil," "just give it some rest," or "try a few of these stretches." The pain probably subsided for a short time, but came back even stronger when you started getting back to certain activities again. The truth is, it's very likely that none of those recommendations did anything to address the root cause of your back pain. Over the last 2 years working with people from around the country to address nagging back issues, I've learned that every individual is different and deserves a unique approach to address the problem. Back pain is a complex issue that can be caused by a variety of things going on in the body. In this report, you'll find solutions to the issue that go beyond "take more pain killers," "see the doctor," or "just give it a rest." I can't guarantee that the information in the report will completely eliminate your pain, but it's a much better approach than getting stuck in your current endless cycle of pain killers and rest. It's time to dig one level deeper and explore a few other avenues to see if you can find the results you are looking for. If you think your back pain could lead to even worse health issues down the road or you feel you are too young to be slowed down by this kind of condition, then you need to read this report. 1) 5 years from now, you are still living with back pain. What kind of changes have occurred in your life? How do your loved ones view you? How do you view yourself? 2) You made the decision 5 years ago (today) to find a long lasting solution to your back pain. You've taken it upon yourself to determine what's causing the pain and address the issues head on. Since then, you've been able to keep active and continue to be someone that friends and family admire. It's time to request this free tips report by clicking on the blue button below. There are only a limited amount of these reports available, so please go ahead and request it now. Evan Lewis is a nationwide leader in Neuro Therapy and founded the Baltimore areas only specialist Neuro Therapy facility for people who want to stay active into their 40s, 50s, and beyond. Look who else came in to Premier Neuro Therapy and left feeling healthy and ready to get back to their favorite activities! "I have suffered from low back pain for as long as I can remember. After one session with Premier Neuro Therapy, I felt incredible. It has been over a month and I have never felt better." ​“...to my surprise the source of my pain was not my back at all.. ​If you are in pain or want your range of motion restored and you want if all fixed fast; literally within days, then Evan is your guy!! Trust in his process because it does work!!"